East Boynton Dental will raffle off three Zoom whitening kits! In Honor of Spring, East Boynton Dental will raffle off 3 Zoom whitening home care kits valued at $100. The Kit includes: Zoom whitening toothpaste, Zoom whitening mouthwash, and 3 Zoom whitening pens. Open to all patients receiving preventive care/hygiene. Call us today to schedule your appointment or click below to request an appointment. East Boynton Dental | Patient Accolades – Thank You! Every now and then, our patients send some kind words our way. “I would like to take a moment to thank you and your staff for all the time, courtesy, and patience given to me during my recent visits. “I know sometimes the business world has a way of taking its toll on consumers and their personal needs but you and your professional staff have raised the bar within your dentistry practice. I always HIDE MY BONES. Are you hiding your teeth because the need cosmetics? You can smile again and not hide your teeth with Dr. Indictor’s expert restorative work. East Boynton Dental- Spring Special! In honor of Spring, East Boynton Dental will be raffling off 3 Zoom Whitening kits valued at $100.00 each. The kits include Zoom Whitening Mouthwash, Zoom Whitening Toothpaste and 3 Zoom Whitening pens. This is open to all patients that receive preventive/hygiene care. We will begin taking entries the first day of Spring (March 20, 2013). The raffle will run through April 30, 2013 on which day the winners will be chosen. Whether you have TWO LEGS or FOUR LEGS, your teeth are important to you. Schedule your six month checkups now. …but humans can change their dental habits. 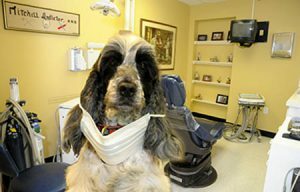 Dental health is important… just ask Derby! Do not wait to check your dental health before it’s too late.